Before Hezekiah’s reign, his father, Ahaz, had introduced pagan practices, indeed, he had proliferated them. They were a part of his national policy strategy. Suddenly, the people of God were out and pagans were in; the good folks were bad, and bad folks were in charge. Godliness was taboo, too narrow, too confining, too old-fashioned, too limited to the ethnic heritage of the Israelites, not inclusive or indicative of the immigrant peoples who now lived among them, not enlightened or cosmopolitan enough, not broadminded or tolerant of other traditions and their beliefs. To level the playing field for paganism to blossom, Ahaz had commanded the temple doors to be bolted. The national religious center, at least the one connected to the historic faith of the nation – was closed. The place where the people gathered to publicly worship YHWH, the God who had delivered them, was locked. Effectively, there was a war on public prayer – not to all gods, just to the One tied to their history. The ‘church’ was closed. The lights in the holy place went dark. The Ark of the Covenant was no longer prized. The priests were fired. The prophets were noted as political dissidents. Everything seemed upside down. The sacrifice of animals ceased, while sacrifices of children were encouraged. How could it happen to such a godly nation? How could they forget who they were? How could they imagine that they had thrown off Pharaoh’s yoke, opened the Red Sea, parted the Jordan, brought down the walls of Jericho, accomplished so much with so little? They were so far away from their historic godly past. Then along came Hezekiah! He was a young man who represented hope for a new generation. His brother had been sacrificed – wonder if the idea ever crossed his mind, that it could have been him? Perhaps this was a moment when the sins of the fathers so shocked a son that it motivated his return to God. May that be the case in our time! Ascending the throne, he called the nation to reform. Isaiah, the prophet, became a colleague, probably an advisor. Hezekiah saw the desperate spiritual condition in the nation and knew that only a spiritual revival would solve it. The problem was not economic, not social, not political, and not military – those were symptoms. He knew the renewal had to be pure and he was determined not to compromise with false religion. From the outset, he reestablished true worship. And he opened Jerusalem’s temple. May we be called as a nation to worship in Spirit and in truth. Join together in prayer for a Great Awakening. 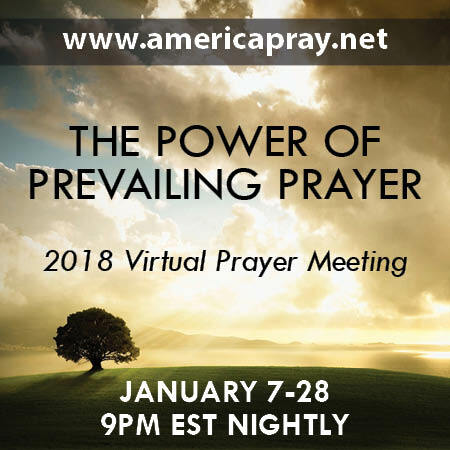 Be a part of the 2018 Virtual Prayer Meeting starting this Sunday! Is anyone really hungry for revival in America? Who really wants to see God move in this nation? I don’t mean an up-surge in church attendance or religious activity, who wants to see real, national revival?